I’ve been a college student, in another city and another state. I went about my days living an average student life. I went to class. I studied. I ate in the cafe. I did well, but something was missing. On a Friday night, my mother called as she normally did. She asked about classes, how my week had gone. It was clear to her that I was in a bit of a rote cycle, with nothing much changing and not much exciting happening. At a minimum, my life was monotonous, if not boring. I had to admit that I wasn’t sure I wanted to stay, and I didn’t know where I would go if I left. She told me that Dr. Bobby Burkes, a colleague and longtime friend, had suggested Grambling State University, the school where he teaches and a school that was not on my radar. I lived 16 hours away and I had never been to Grambling or Louisiana. I grew up in Washington, D.C. and its nearby suburbs, so I was yearning for something different from my city lifestyle. Maybe I could do without city lights, the bustling streets and metro buses. Maybe I could handle a slower pace and the sounds of crickets and frogs as dusk fell. And what was this place that they claim, “where everybody is somebody”? I called my mother right away to share the good news. I was on my way to Grambling, Louisiana, for a June visit. I liked it. I had found my school. After an eventful first several days on campus in August, I know why GSU is the place “where everybody is somebody.” Our students and alums bleed black and gold pride. I am an introvert by nature. I shy away from any kind of scene, often wondering how people might look at me and fearing that some may perceive me negatively. Day by day, though, at Grambling I feel that less and less. I don’t know how this has happened, but I’m coming out of my cocoon. I’m comfortable talking with strangers, striking up conversations in situations that would have made me uncomfortable previously. By my city girl standards, the campus sits in the middle of nowhere. But it doesn’t matter. The campus is so friendly and warm. There are plenty of activities and events and my life is far from monotonous and boring. 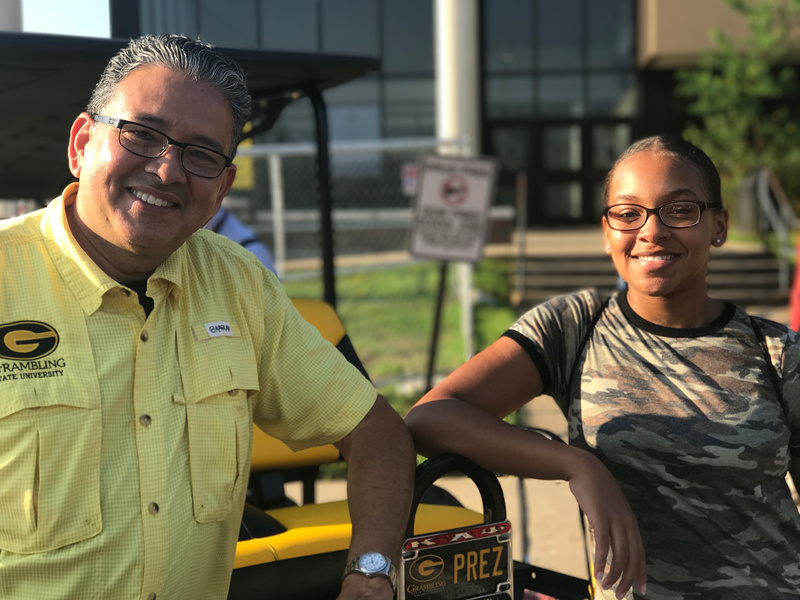 I was the lucky student chosen to receive a ride on the presidential golf cart on the first day of school with President Rick Gallot. I was the one on the cart, but that let me know that he truly cares about every student. They want to see us succeed. They want us to work hard, so they work hard. They want more for us than some of us may want at this stage. I haven’t stumbled yet, but I know when I do that I’ll be given a Band-Aid and get the encouragement I need to get up and get back in the game. If my first few days are any indication of what is to come, I know I have a great team rooting for me. I transferred to Grambling State University, and I know I made the right choice. This is where I belong. I’m somebody, and I know everybody is somebody, too. Jasmine Harris, 18, is a transfer student from Bowie State University in Bowie, Maryland. She graduated from McKinley Technology High School in Washington, D.C. in 2016. She’s chosen mass communication as her major at Grambling State University.